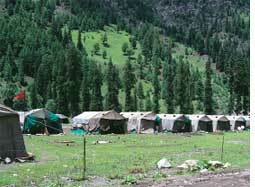 Amarnath land transfer: who's worried about environment? for the first time environment became a subject of political debate in Jammu and Kashmir, with the controversial transfer of about 40 hectares of forest land to the Shri Amarnath Shrine Board. The controversy erupted when Arun Kumar, the chief executive officer of the board, claimed that the government had permanently transferred the land at Baltal and Domail to it and that the board had sought permission from the state government to construct permanent lavatories on the land. The separatist group All Party Hurriyat Conference (aphc) was quick to react, asking people to protest against the decision. Syed Ali Shah Geelani, chairman, aphc (g), said, "We want to protect our environment and stop others exploiting it. aphc is considering setting up an environmental committee." Never before did separatists talk about environment in Kashmir. With the assembly elections round the corner, the mainstream parties also started exploiting the issue. The Peoples Democratic Party withdrew support to the Congress-led coalition government, forcing chief minister Ghulam Nabi Azad to resign. Qazi Mohammad Afzal, a senior pdp leader and forests minister, accused the chief minister of pressuring him to sign the order of the land transfer. Azad contended it was the forest minister and the deputy chief minister, both pdp leaders, who were dealing with the matter. The opposition bjp called a nationwide bandh after the government cancelled the land transfer. Riyaz Ahmad, a lawyer in Srinagar, said, "The issue is being politicized and communalized. It is a legal matter and as per the Jammu and Kashmir Forest (Conservation) Act, 1997, and Jammu and Kashmir Forest (Conservation) Rules, 2000, the forest land can be transferred only for the forest use." Imtiyaz Ahmad, executive secretary of the Srinagar-based ngo Centre for Human Development, agreed that political parties were exploiting the issue.